The Tibetan Mastiff is a large watchdog with ancient origins that normally-even today- lives high up in the Himalaya mountains and central Asia. Fragments found in the history writing reveal the long journey of the TM. It is generally believed that the original Tibetan Mastiff is the ancestor of many of the large breeds of today as well as the European mastiffs; it is definitely the only existing group of the old moloss breeds. An interesting fact is that until quite lately there existed a similar kind of breed in Sweden. The breed might be a distant relative of the moloss breeds, or the likelihood is coincidental: “Dalbohund” (=”Dalbo-dog”) in Dalsland was a well-known guard of houses and the cattle against wild animals. This breed went extinct some decades before the Swedish Kennel Club was founded. The ancient barophagus that went extinct in the Tertiary period is believed to be the ancestor of the TM. The original name for TM in Tibet was “Do-Khyi”. A lot has been written of the breed since 1121 B.C. ; this is when a Chinese manuscript was dated telling of a Tibetan delegation giving as a symbol of friendship “a big dog” to the Emperor of China at the time, Wou-Wang. Marco Polo later described the TM as “a dog in the size of a donkey”, “a cross-breed with tiger, fierce and wild”, (the cattle in the area of northern China and Tibet was a lot smaller in size than modern cattle). It was mentioned as an unmutable and unconditional guard, prepared to kill every trespasser, man or animal. They were even used for hunting yak, bear and deer. There were mainly two different kinds of TM to protect the cattle and to help the village people: “bhotia”/”do-khyi”, a lighter herding dog, and “tsang-khyi”, watchdog in the yards. Bhotia wasn’t a herding dog as we know sheepdogs today: it defended shepherds and cattle against wild animals and robbers. Tsang-khyi has been the guardian of monasteries and villages over the centuries. The most beautiful individuals of the tsang-khyi were called sang-khyi and were owned by persons in the highest positions in Tibet. This kind of dogs were sought after and a high status symbol. The two types mentioned above are also the ones that are mostly breeded in the west today: in the USA usually the larger tsang-khyi and in Europe the lighter do-khyi (bhotia). There has originally existed no less than five types of TM: dzi-khyi, naj-khyi, tsang-khyi, do-khyi and sgo-khyi. The breed came at a very early stage down to India, where it became shorter-haired – (this is likely to happen even today as modern representants of the breed are taken to warmer countries), and it travelled on from India further to Assyria. Skulls of dogs have been discovered in Persia and Syria dating from the Stone and Bronze Age, apparently belonging to the same family with the modern TM. 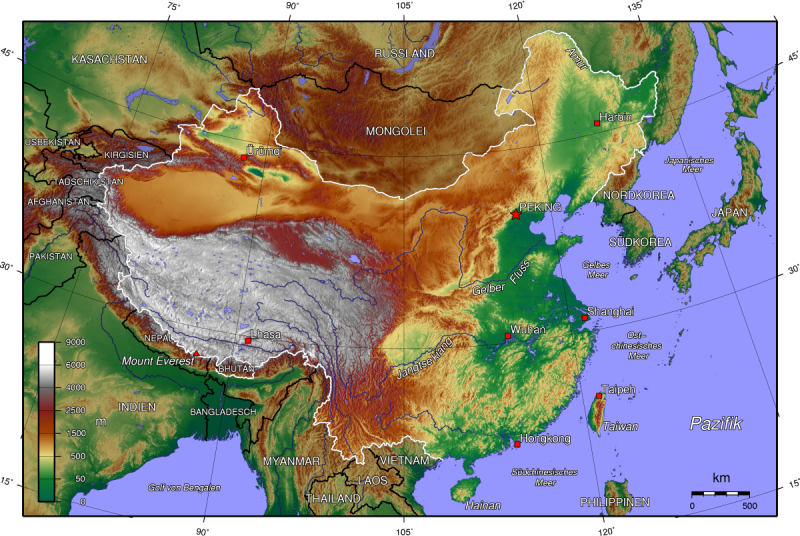 It is difficult to find quite pure-breeded TM in Tibet, Nepal and the Himalaya area today; however, they are still used as watchdogs and sometimes as guardians of a caravan against wolves and robbers. Herodotos tells in early scripts of a large amount of Indian dogs kept in Babylon. The Romans and even the Greek used the TM on their military expeditions reaching as far west as Europe. These dogs “took part” even in the battle, and fought on the Roman arenas against bears, lions and gladiators. 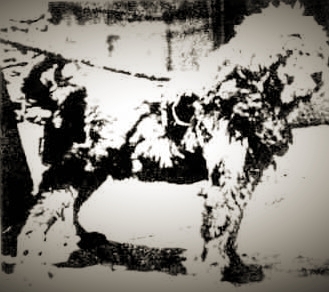 Captain Samuel Turner mentioned in his script “An account of an Embassy to the Court of the Teshoo Lama in Tibet” making acquaintance with a very large dog breed while in Tibet, but unfortunately he doesn’t give a more detailed description of the dog. Lord Hardinge sent 1847 a big dog “Siring” to Queen Victoria from Tibet. The first dog shows in England were given 1859 and 1873. “The Kennel Club” was established, and a pedigree register was created with 4027 dogs in it. The big Tibetan dog was now officially given the name “Tibetan Mastiff” for the first time, and England “happened” to be registered as the land of origin. There are no known imports of TM to England between the 2nd World War and the 1970′s. The American president Eisenhower got a TM 1950 as a gift from the Dalai Lama. Import increased from Nepal and India to USA in the beginning of the 1970′s, and TM is today quite usual as a family- and watchdog in the USA. The long and close relation between TM and man has left traces in the breed. It is known to be extremely skillful at “reading” and understanding man, as well as dealing with different situations. Generations after generations of TMs have worked as guards of yak- and sheep- flocks, and this has created a skillful, brave watchdog instead of a “killer”. TM has learned to judge, to control its temperament and strength, to be brave and resistant, and to show great loyality and kindness to its own.